Mercurio D Rivera has been tipped as ‘the next big thing’ by critics and readers alike. He first burst onto the scene in 2006 with “Longing for Langalana”. Featured in Interzone, “Langalana” won the magazine’s readers’ poll for best story of that year and became the first of many pieces to gain honourable mention in Gardner Dozois’ Year’s Best anthology. Since then, Mercurio’s work has appeared regularly in Interzone, as well as such venues as Asimov’s, Nature, Black Static, and Solaris Rising 2. In 2010, his story “Tu Sufrimiento Shall Protect Us” was shortlisted for the World Fantasy Award and gained honourable mention in Ellen Datlow’s Year’s Best Horror. 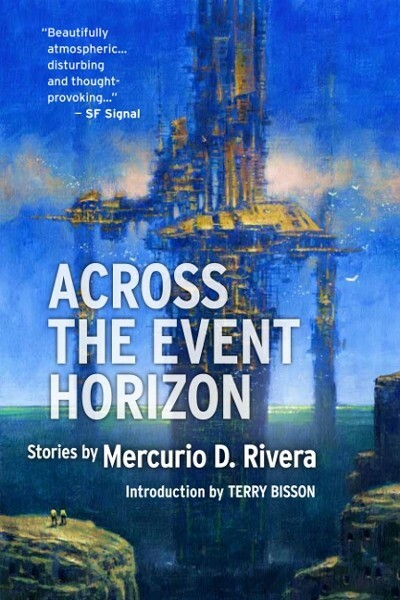 Across the Event Horizon contains the very best of Mercurio’s work to date; fourteen stories selected by the author himself, including “Langalana” and “Tu Sufrimiento”. “I was blown away by Mercurio D. Rivera’s “The Scent of Their Arrival”; it’s the finest story I’ve read for some time.” – Gareth D Jones. Across the Event Horizon is launched April 2013, as an A5 paperback, an e-book, and a signed hardback edition limited to just 100 copies.